The major relic of St. Jean Vianney’s incorrupt heart visited the Diocese of Kansas City-St. Joseph at the Cathedral in St. Joseph, Mo. on Tuesday, March 19, the Feast of St. Joseph. The day featured 8 a.m. Mass followed by Veneration of the relic until 8 p.m., 5:30 p.m. Vespers, and confessions heard from 9 a.m.-8 p.m.
A parish priest of Ars, France in the early- to mid- 1800’s, St. Jean Vianney is most commonly known for his gift as a confessor, being able to read hearts and oftentimes spending up to 18 hours a day hearing confessions. He is the patron saint of parish priests and confessors. 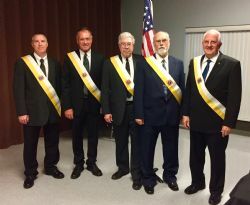 The Shrine of Ars, France, entrusted the relic to the Knights of Columbus for a national tour in the U.S., from November 2018 through early June 2019. 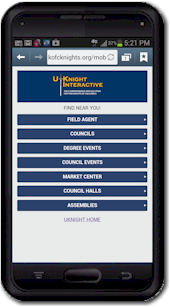 More details about the national tour schedule are found on the Knights of Columbus website here. Our newest Council member, Richard Sadler, completed his 2nd and 3rd Degrees on Sunday October 28th in back-to-back ceremonies conducted at St Joseph Council #571. Richard was a charter member of Council 15126 before transferring to Le Blond Council #5067 while his children were in school at LB. He transferred back to St Francis Xavier Council in order to get more involved in service to his registered parish. Richard works for Al J Mueller Construction. He participated in the two Exemplifications along with seven seminarian students (see photo) from Conception Abbey Seminary. Please welcome him back to our council when you see him around the parish. The Knights of Columbus sponsored the St Joseph Life Walk and Rally on Sunday, October 7, 2018. The Life Walk portion began at Frederick Avenue Baptist Church, passed the Missouri Western State University Spring Sport Complex and St Joseph East Hills Library before ending at the Le Blond High School Gymnasium for a Life Rally with motivational speakers and musical entertainment. Dan Deatherage from Council 15126 was the Event Chair for the Knights of Columbus. Chaplain - Fr Joseph Miller, C.PP.S. The installation of Council Officers took place on July 10th covered dish dinner in the SFX Parish Center. Congratulations to these fine brother Knights! Council 15126 Grand Knight John Catron was installed as Missouri State District #2 Deputy by newly elected State Deputy Robert Hawkins during a ceremony at the summer District Deputy Meetings July 14-15th in Jefferson City, MO. Congratulations to John on his new appointment. Community Blood Center of Kansas City presented one of their Service-Based Organization Blood Drop Awards to St Francis Xavier Knights of Columbus Council 15126 for being one of the most successful blood drive organizations in the Kansas City Region for 2017. The award was presented at the recent Blood Drive Chairpersons Luncheon. Accepting the award for the Council were our bi-monthly blood drive chairs - Mike Violett and Mark Werner. This award will be displayed in the Council memento cabinet in the St Francis Xavier Parish Center. Congratulations to Mike and Mark for their coordination and leadership of these blood drives! Council 15126 was presented with their seventh successive award from the Missouri Religious Information Bureau at their May business meeting. The award was presented to Grand Knight Chuck Hayes by the current District Deputy Jay Pflugradt Jr. Council 15126 has contributed to RIB at the 125% level for the past six years and received a certificate, a lapel pin and an engraved plate to affix to their existing award plaque in recognition of their 2016-2017 donation.